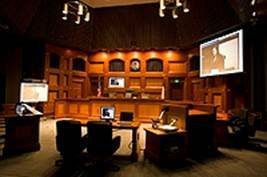 At Digital Verdict we are able to set up any courtroom or mock trail with the exact equipment needed. From audio systems to projectors and everything in between, we have anything you may need. Trained Technicians Available To Manage Your Presentation in the Courtroom. Digital Verdict has the equipment on hand when you need it! Our inventory consists of only the top brands such as Dell, Samsung, Kramer, Extron, Sanyo and Anchor, and can be shipped virtually anywhere. With knowledgeable technicians on staff, we work directly with you and the court to create a professional set up. Call your sales representative to get pricing and suggestion on how we can meet your presentation needs.